On This Good Friday, I wanted to share the following article on the Historical Evidence for the Resurrection with you. Good Friday and Resurrection Sunday provide a rich time of remembrance of the Lord's ultimate sacrifice on the cross and a time of celebration because of His victory over death! May you take time to consider and celebrate all God has done because of His great love for you! May you also take time to praise Him for Jesus’ sacrifice for you that you might have life in Him! Enjoy this time of celebration with your friends and loved ones! Please see the below Article. A method commonly used today to determine the historicity of an event is "inference to the best explanation." William Lane Craig describes this as an approach where we "begin with the evidence available to us and then infer what would, if true, provide the best explanation of that evidence." In other words, we ought to accept an event as historical if it gives the best explanation for the evidence surrounding it. Jesus' disciples had real experiences with one whom they believed was the risen Christ. Virtually all scholars who deal with the resurrection, whatever their school of thought, assent to these three truths. We will see that the resurrection of Christ is the best explanation for each of them individually. But then we will see, even more significantly, that when these facts are taken together we have an even more powerful case for the resurrection--because the skeptic will not have to explain away just one historical fact, but three. These three truths create a strongly woven, three chord rope that cannot be broken. First, the resurrection was preached in the same city where Jesus had been buried shortly before. Jesus' disciples did not go to some obscure place where no one had heard of Jesus to begin preaching about the resurrection, but instead began preaching in Jerusalem, the very city where Jesus had died and been buried. They could not have done this if Jesus was still in his tomb--no one would have believed them. No one would be foolish enough to believe a man had raised from the dead when his body lay dead in the tomb for all to see. As Paul Althaus writes, the resurrection proclamation "could not have been maintained in Jerusalem for a single day, for a single hour, if the emptiness of the tomb had not been established as a fact for all concerned." Second, the earliest Jewish arguments against Christianity admit the empty tomb. In Matthew 28:11-15, there is a reference made to the Jew's attempt to refute Christianity be saying that the disciples stole the body. This is significant because it shows that the Jews did not deny the empty tomb. Instead, there "stolen body" theory admitted the significant truth that the tomb was in fact empty. The Toledoth Jesu, a compilation of early Jewish writings, is another source acknowledging this. It acknowledges that the tomb was empty, and attempts to explain it away. Further, we have a record of a second century debate between a Christian and a Jew, in which a reference is made to the fact that the Jews claim the body was stolen. So it is pretty well established that the early Jews admitted the empty tomb. Why is this important? Remember that the Jewish leaders were opposed to Christianity. They were hostile witnesses. In acknowledging the empty tomb, they were admitting the reality of a fact that was certainly not in their favor. So why would they admit that the tomb was empty unless the evidence was too strong to be denied? Dr. Paul Maier calls this "positive evidence from a hostile source. In essence, if a source admits a fact that is decidedly not in its favor, the fact is genuine." Third, the empty tomb account in the gospel of Mark is based upon a source that originated within seven years of the event it narrates. This places the evidence for the empty tomb too early to be legendary, and makes it much more likely that it is accurate. What is the evidence for this? I will list two pieces. A German commentator on Mark, Rudolf Pesch, points out that this pre-Markan source never mentions the high priest by name. "This implies that Caiaphas, who we know was high priest at that time, was still high priest when the story began circulating." For "if it had been written after Caiaphas' term of office, his name would have had to have been used to distinguish him from the next high priest. But since Caiaphas was high priest from A.D. 18 to 37, this story began circulating no later than A.D. 37, within the first seven years after the events," as Michael Horton has summarized it. Furthermore, Pesch argues "that since Paul's traditions concerning the Last Supper [written in 56] ( 1 Cor 11 ) presuppose the Markan account, that implies that the Markan source goes right back to the early years" of Christianity (Craig). So the early source Mark used puts the testimony of the empty tomb too early to be legendary. Fourth, the empty tomb is supported by the historical reliability of the burial story. NT scholars agree that he burial story is one of the best established facts about Jesus. One reason for this is because of the inclusion of Joseph of Arimethea as the one who buried Christ. Joseph was a member of the Jewish Sanhedrein, a sort of Jewish supreme court. People on this ruling class were simply too well known for fictitious stories about them to be pulled off in this way. This would have exposed the Christians as fraud's. So they couldn't have circulated a story about him burying Jesus unless it was true. Also, if the burial account was legendary, one would expect to find conflicting traditions--which we don't have. But how does the reliability of Jesus' burial argue that the tomb was empty? Because the burial account and empty tomb account have grammatical and linguistic ties, indicating that they are one continuous account. Therefore, if the burial account is accurate the empty tomb is likely to be accurate as well. Further, if the burial account is accurate then everyone knew where Jesus was buried. 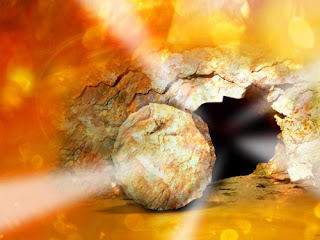 This would have been decisive evidence to refute the early Christians who were preaching the resurrection--for if the tomb had not been empty, it would have been evident to all and the disciples would have been exposed as frauds at worst, or insane at best. Fifth, Jesus' tomb was never venerated as a shrine. This is striking because it was the 1st century custom to set up a shrine at the site of a holy man's bones. There were at least 50 such cites in Jesus' day. Since there was no such shrine for Jesus, it suggests that his bones weren't there. Sixth, Mark's account of the empty tomb is simple and shows no signs of legendary development. This is very apparent when we compare it with the gospel of Peter, a forgery from about 125. This legend has all of the Jewish leaders, Roman guards, and many people from the countryside gathered to watch the resurrection. Then three men come out of the tomb, with their heads reaching up to the clouds. Then a talking cross comes out of the tomb! This is what legend looks like, and we see none of that in Mark's account of the empty tomb--or anywhere else in the gospels for that matter! Seventh, the tomb was discovered empty by women. Why is this important? Because the testimony of women in 1st century Jewish culture was considered worthless. As Craig says, "if the empty tomb story were a legend, then it is most likely that the male disciples would have been made the first to discover the empty tomb. The fact that despised women, whose testimony was deemed worthless, were the chief witnesses to the fact of the empty tomb can only be plausibly explained if, like it or not, they actually were the discoverers of the empty tomb." Because of the strong evidence for the empty tomb, most recent scholars do not deny it. D.H. Van Daalen has said, "It is extremely difficult to object to the empty tomb on historical grounds; those who deny it do so on the basis of theological or philosophical assumptions." Jacob Kremer, who has specialized in the study of the resurrection and is a NT critic, has said "By far most exegetes hold firmly to the reliability of the biblical statements about the empty tomb" and he lists twenty-eight scholars to back up his fantastic claim. I'm sure you've heard of the various theories used to explain away the empty tomb, such as that the body was stolen. But those theories are laughed at today by all serious scholars. In fact, they have been considered dead and refuted for almost a hundred years. For example, the Jews or Romans had no motive to steal the body--they wanted to suppress Christianity, not encourage it by providing it with an empty tomb. The disciples would have had no motive, either. Because of their preaching on the resurrection, they were beaten, killed, and persecuted. Why would they go through all of this for a deliberate lie? No serious scholars hold to any of these theories today. What explanation, then, do the critics offer, you may ask? Craig tells us that "they are self-confessedly without any explanation to offer. There is simply no plausible natural explanation today to account for Jesus' tomb being empty. If we deny the resurrection of Jesus, we are left with an inexplicable mystery." The resurrection of Jesus is not just the best explanation for the empty tomb, it is the only explanation in town! It is generally agreed by critical scholars that Paul receive this creed from Peter and James between 3-5 years after the crucifixion. Now, Peter and James are listed in this creed as having seen the risen Christ. Since they are the ones who gave this creed to Paul, this is therefore a statement of their own testimony. As the Jewish Scholar Pinchahs Lapide has said, this creed "may be considered the statement of eyewitnesses." Which of these is most likely? Were they lying? On this view, the disciples knew that Jesus had not really risen, but they made up this story about the resurrection. But then why did 10 of the disciples willingly die as martyrs for their belief in the resurrection? People will often die for a lie that they believe is the truth. But if Jesus did not rise, the disciples knew it. Thus, they wouldn't have just been dying for a lie that they mistakenly believed was true. They would have been dying for a lie that they knew was a lie. Ten people would not all give their lives for something they know to be a lie. Furthermore, after witnessing events such as Watergate, can we reasonably believe that the disciples could have covered up such a lie? Because of the absurdity of the theory that the disciples were lying, we can see why almost all scholars today admit that, if nothing else, the disciples at least believed that Jesus appeared to them. But we know that just believing something to be true doesn't make it true. Perhaps the disciples were wrong and had been deceived by a hallucination? The hallucination theory is untenable because it cannot explain the physical nature of the appearances. The disciples record eating and drinking with Jesus, as well as touching him. This cannot be done with hallucinations. Second, it is highly unlikely that they would all have had the same hallucination. Hallucinations are highly individual, and not group projections. Imagine if I came in here and said to you, "wasn't that a great dream I had last night?" Hallucinations, like dreams, generally don't transfer like that. Further, the hallucination theory cannot explain the conversion of Paul, three years later. Was Paul, the persecutor of Christians, so hoping to see the resurrected Jesus that his mind invented an appearance as well? And perhaps most significantly, the hallucination theory cannot even deal with the evidence for the empty tomb. Since the disciples could not have been lying or hallucinating, we have only one possible explanation left: the disciples believed that they had seen the risen Jesus because they really had seen the risen Jesus. So, the resurrection appearances alone demonstrate the resurrection. Thus, if we reject the resurrection, we are left with a second inexplicable mystery--first the empty tomb and now the appearances. Could it have been Christian influences? Craig writes, "Since the belief in the resurrection was itself the foundation for Christianity, it cannot be explained as the later product of Christianity." Further, as we saw, if the disciples made it up, then they were frauds and liars--alternatives we have shown to be false. We have also shown the unlikeliness that they hallucinated this belief. But what about pagan influences? Isn't it often pointed out that there were many myths of dying and rising savior gods at the time of Christianity? Couldn't the disciples have been deluded by those myths and copied them into their own teaching on the resurrection of Christ? In reality, serious scholars have almost universally rejected this theory since WWII, for several reasons. First, it has been shown that these mystery religious had no major influence in Palestine in the 1st century. Second, most of the sources which contain parallels originated after Christianity was established. Third, most of the similarities are often apparent and not real--a result of sloppy terminology on the part of those who explain them. For example, one critic tried to argue that a ceremony of killing a bull and letting the blood drip all over the participants was parallel to holy communion. Fourth, the early disciples were Jews, and it would have been unthinkable for a Jew to borrow from another religion. For they were zealous in their belief that the pagan religions were abhorrent to God. Jewish influences cannot explain the belief in the resurrection, either. 1st century Judaism had no conception of a single individual rising from the dead in the middle of history. Their concept was always that everybody would be raised together at the end of time. So the idea of one individual rising in the middle of history was foreign to them. Thus, Judaism of that day could have never produced the resurrection hypothesis. This is also another good argument against the theory that the disciples were hallucinating. Psychologists will tell you that hallucinations cannot contain anything new--that is, they cannot contain any idea that isn't already somehow in your mind. Since the early disciples were Jews, they had no conception of the messiah rising from the dead in the middle of history. Thus, they would have never hallucinated about a resurrection of Christ. At best, they would have hallucinated that he had been transported directly to heaven, as Elijah had been in the OT, but they would have never hallucinated a resurrection. These three independently established facts also make alternative explanations less plausible. It is generally agreed that the explanation with the best explanatory scope should be accepted. That is, the theory that explains the most of the evidence is more likely to be true. The resurrection is the only hypothesis that explains all of the evidence. If we deny the resurrection, we must come up with three independent natural explanations, not just one. For example, you would have to propose that the Jews stole the body, then the disciples hallucinated, and then somehow the pagan mystery religions influenced their beliefs to make them think of a resurrection. But we have already seen the implausibility of such theories. And trying to combine them will only make matters worse. As Gary Habermas has said, "Combining three improbable theories will not produce a probable explanation. It will actually increase the degree of improbability. Its like putting leaking buckets inside each other, hoping each one will help stop up the leaks in the others. All you will get is a watery mess." Before examining, briefly, the implications of the resurrection, I wish to take a quick look at perhaps the most popular theory today against the resurrection--that it was a legend that developed over time. The facts we have established so far are enough to put to rest any idea of a legend. First, we have seen that the testimony of the resurrection goes back to the original experiences. Remember the eyewitness creed of 1 Corinthians 15:3-5? That is the first-hand testimony of Peter and James. So it is not the case that the resurrection belief evolved over time. Instead, we have testimony from the very people who claimed to have experienced it. Second, how can the myth theory explain the evidence for the empty tomb? Third, the myth theory cannot explain the origin of the Christian faith--for we have already seen that the real resurrection of Christ is the only adequate cause for the resurrection belief. Fourth, the myth theory cannot explain the conversion of Paul. Would he be convinced by a myth? His conversion was in fact too early for any myth to have developed by then. How then can we explain his conversion? Do we dare accuse him of lying when he said he saw the risen Christ? Fifth, we have seen the evidence that the empty tomb story in Mark was very early--within seven years of the events. That is not long enough for legends. Sixth, we have seen that the empty tomb narrative lacks the classic traits of legendary development. Seventh, critical scholars agree that the resurrection message was the foundation of the preaching of the early church. Thus, it could not have been the product of the later church. Ninth, there is very good evidence that the gospels and Acts were written very early. For example, the book of Acts never records the death of Paul, which occurred in about 64, or the destruction of Jerusalem, which occurred in 70. Since both Jerusalem and Paul are key players in the book of Acts, it seems strange that their demises would be omitted. The best explanation seems to be that Paul's death and Jerusalem's destruction are omitted because the book of Acts had been completed before they happened. This means that Acts was written before 64, when Paul died. Since Acts is volume 2 of Luke's writings, the book of Luke being the first, then the Gospel of Luke was even earlier, perhaps 62. And since most scholars agree that Mark was the first gospel written, that gospel would have been composed even earlier, perhaps in the late 50s. This brings us within twenty years of the events, which is not enough time for legends to develop. So the legend theory is not very plausible. But, in conclusion, don't we have to ask ourselves what implications this has? Why does it matter? Or is this some dry, dusty old piece of history that has no relevance to our lives? I believe that the resurrection is the most important truth in the world. It has far reaching implications on our lives. First, the resurrection proves that the claims Jesus made about himself are true. What did Jesus claim? He claimed to be God. One might say, "I don't believe that He claimed to be God, because I don't believe the Bible." But the fact is that even if we take only the passages which skeptical scholars admit as authentic, it can still be shown that Jesus claimed to be God. I have written a paper elsewhere to demonstrate this. So it is impossible to get around the fact that Jesus claimed to be God. Now, if Jesus had stayed dead in the tomb, it would be foolish to believe this claim. But since He rose from the dead, it would be foolish not to believe it. The resurrection proves that what Jesus said about Himself is true--He is fully God and fully man. Second, have you ever wondered what reasons there are to believe in the Bible? Is there good reason to believe that it was inspired by God, or is it simply a bunch of interesting myths and legends? The resurrection of Jesus answers the question. If Jesus rose from the dead, then we have seen this validates His claim to be God. If He is God, He speaks with absolute certainty and final authority. Therefore, what Jesus said about the Bible must be true. Surely you are going to accept the testimony of one who rose from the dead over the testimony of a skeptical scholar who will one day die himself--without being able to raise himself on the third day. What did Jesus say about the Bible? He said that it was inspired by God and that it cannot error. I will accept the testimony of Jesus over what I would like to be true and over the opinions of other men and women. Therefore I believe that the Bible is inspired by God, without error. Don't get misled by the numerous skeptical and unbelieving theories about the Bible. Trust Jesus--He rose from the dead. Third, many people are confused by the many different religions in the world. Are they all from God? But on a closer examination we see that they cannot all be from God, because they call contradict each other. They cannot all be true any more than 2+2 can equal both 4 and 5 at the same time. For example, Christianity is the only religion that believes Jesus Christ is both God and man. All other religions say that he was a good man only-and not God. Clearly, both claims cannot be right! Somebody is wrong. How are we to know which religion is correct? By a simple test: which religion gives the best evidence for its truth? In light of Christ's resurrection, I think that Christianity has the best reasons behind it. Jesus is the only religious leader who has risen from the dead. All other religious leaders are still in their tombs. Who would you believe? I think the answer is clear: Jesus' resurrection demonstrates that what He said was true. Therefore, we must accept his statement to be the only way to God: "I am the way, the truth, and the life; no one comes to the Father, except through me" (John 14:6). Fourth, the resurrection of Christ proves that God will judge the world one day. The apostle Paul said, "God is now declaring to men that all everywhere should repent, because He has fixed a day in which He will judge the world in righteousness through a Man whom He has appointed, having furnished proof to all men by raising Him from the dead." The resurrection of Christ proves something very personal and significant to each of us--we will have to give an account of ourselves to a holy God. And if we are honest with ourselves, we will have to admit that we do not measure up to his standard. We are sinful, and therefore deserve to be condemned at His judgment. Which leads to our fifth point. The resurrection of Christ provides genuine hope for eternal life. Why? Because Jesus says that by trusting in Him, we will be forgiven of our sins and thereby escape being condemned at the judgment. The NT doesn't just tell us that Christ rose from the dead and leave us wondering why He did this. It answers that He did this because we are sinners. And because we have sinned, we are deserving of God's judgment. Since God is just, He cannot simply let our sins go. The penalty for our sins must be paid. The good news is that God, out of His love, became man in Jesus Christ in order to pay the penalty for sinners. On the cross, Jesus died in the place of those who would come to believe in Him. He took upon Himself the very death that we deserve. The apostle Paul says "He was delivered up because of our sins." But the apostle Paul goes on to say "He was raised to life because of our justification." Paul is saying that Christ's resurrection proves that His mission to conquer sin was successful. His resurrection proves that He is a Savior who is not only willing, but also able, to deliver us from the wrath of God that is coming on the day of judgment. The forgiveness that Jesus died and rose to provide is given to those who trust in Him for salvation and a happy future. Let me close with the sixth reason the resurrection is significant. The Bible says that Christ's resurrection is the pattern that those who believe in Him will follow. In other words, those who believe in Christ will one day be resurrected by God just as He was. The resurrection proves that those who trust in Christ will not be subject in eternity to a half-human existence in just their souls. It proves that our bodies will be resurrected one day. Because of the resurrection of Christ, believers will one day experience, forever, the freedom of having a glorified soul and body.